A few inches can really change how a person looks and feels in an outfit. Although wearing heels is the quickest way to add height, here are some unusual tips that will give you a few more inches. Try flared jeans – Try a pair of fitted jeans that are flared at the knees. The waist band should fit your natural waist and be super slim for optimal height. Maxi skirts – Simple floor length skirts will give petite ladies extra length. Choose solid colors that skim the length of your body. Keep the top fitted and make sure the top stops at your waist or tuck in your top. Go short – If you are petite, either go super short or super long. Miniskirts or shorts show more skin, which creates the illusion of longer legs. 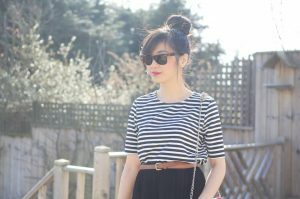 A top knot – Piling your hair on the top of your head will create the illusion of height. Wear one color – Creating a vertical line will make anyone look taller. Look at wearing one color from head to toe. Black is a simple, chic choice that works well for most body shapes. High-waist bottoms – To elongate your lower half and make your legs look longer, look at high waisted bottoms in the form of skirts, shorts, and pants. Slim styles – Look at investing in designs that are less flared and more tapered to your body to make the most of your height.